The Fascinating and Beautiful Heather!! Our lady wrap star, Heather (yes, our second last lady wrap star is also Heather – I couldn’t plan this sort of thing if I tried!) has been part of the Wrapunzel community since… well.. since before it was the Wrapunzel community! Over the years I’ve caught bits and pieces of her story and about whom she is. She always came off as such a warm, stable, articulate and just, well… such a cool person that I really wanted to know! She is all kinds of awesome and I’m so happy to introduce her to you officially! In a word, her story is FASCINATING. A must read. Here’s Heather! First, I am INCREDIBLY honored to be asked to write for Andrea’s blog. It is definitely a high point for me in my covering journey! It’s been a rather bumpy one, and something that is not seen often where I live, in Southern West Virginia. You don’t see many women like me in this community and buying from the store: women with beautiful tichels and adornments covering their hair. I’ve not had any rude comments as of this writing, but I HAVE had many compliments. My family is a mixed bag of support and reluctance. My husband is supportive of me covering (now), my father hasn’t said anything for or against it. My mother, though, is okay with it, so long as I don’t wear it in places that it would be seen as unusual. She asked me if I was going to “wear that thing” to a job interview. I told her that I was, that it was my head and if they had an issue with that, then I wouldn’t want to work there in the first place. I have many cousins who love my tichels, and have expressed interest in purchasing and wearing their own (and I have offered my time to help them as soon as they want me to!) I see a few ladies covering their hair; it’s rare, but I have seen them. They wear the hijab, and it’s lovely, and I think quite brave of them, in all honesty. I always brace myself for a nasty comment when I leave my house, and while I HAVE gotten strange looks, I have yet to hear a snide remark. Good thing, too. I’m not as apt to take it as I was when I was younger. As for religion, I’m not Jewish. I’m not Christian or Muslim either. I’m a very secular lady who has no religious reason at this time to cover. I did have one at one point, but I have done a lot of soul searching and found that religion is just not something that I feel is necessary in my life right now. It took a long time for me to admit, even to myself, that I fall into the agnostic atheist category, but I’m there, and I feel perfectly happy (though I do wish I had a local community to be a part of sometimes). I won’t reveal what religious beliefs I had after I left Christianity (I don’t want certain people to see this and decide they wouldn’t want to be part of my life anymore), but I will explain my coming to my current position as best I can. Photo collage by Heather’s husband, Heath! He is a graphic artist and does awesome work! I have always had a love/hate relationship with my hair. Ever since I was a child, I would take a lock of my hair and place it between my index and middle fingers and let it slide through. I loved (and still love) the silky, cool feeling of my hair moving between my fingers. A few strands would come out, but nothing major. It drove my parents up the wall, and they would always tell me to stop if they were in the same room with me. I also never could fix my hair properly. I tried so hard, and got so upset every day. It got to the point where I was begging my mother to help me fix my hair – and this was all the way into high school! I was just terrible with my hair. Makeup, I could do that! I rocked out makeup, manicures, etc. I even got asked to do prom makeup for people! But my hair just never did anything I asked it to do. So most of the time, when I was in college, I would just pull it back into a tight bun or a ponytail and let it go at that. I also love coloring my hair. My natural color is a light reddish brown, but it’s currently dark brown/black (I’m a community theatre actress and I colored it for a role last summer). I have always wanted to wear funky colors in my hair, and I even went so far as to bleach it and color it teal in 2004! I LOVED it. Every morning I would get up and look at my hair, and was just amazed at how gorgeous the color looked. Unfortunately, it was a wash out color, and when it started looking dingy, I colored my hair black. It stayed that color until I moved home from college. I was raised Christian. I went to church, belonged to Christian school groups, read the Teen Bible, etc. I started seeing a guy who had books about OTHER religions. I had no idea that anything else really existed. We don’t have much religious diversity here (other than different denominations of Christianity). Anyway, I found a book that struck a chord in me and I devoted myself to the religion within its pages. I won’t elaborate on what that religion was, as I am not totally open with a lot of people in my area. (Following a different religion usually gets you harassed here.) During college, I grew apart from practicing ANY religion, mainly due to depression and sadness (I married the guy I was seeing and he became abusive). I left him in 2006, right after I gave birth to a son. After I met the man who would later become my actual husband, I began practicing my religion again, and I did so until recently. During my reawakening, I began reading about the priestesses of Hestia and Hera, the Greek Goddesses of the hearth and home, and marriage and family, respectively. I have always been fascinated with ancient Greek mythology/theology and in all the research I did, I discovered something: both of those Goddesses wore VEILS! Their Priestesses wore VEILS! They all covered their hair! I was fascinated. I still am! I had never thought about covering my hair aside from doing it to keep it out of my face, but I saw that women used to cover their hair, that they would wear it like a crown. They were the Queens in their homes, in their marriages. That appealed to me greatly, and is a reason why I cover. I am the QUEEN of my life, and these tichels are my crowns! Then I found Andrea’s and Rivka Malka’s YouTube channels. I was absolutely smitten! I started wearing bandannas frequently around the house, doing my chores with a smile on my face. I felt much more connected somehow, and I couldn’t figure out why. I was on Facebook a lot (as I still am) and a friend and I discovered a group that was for women with similar beliefs to me who covered their hair. I decided to give it a try, both the group AND the covering. The group wasn’t really for me, I found, and at the time, I wasn’t very good at covering. I didn’t have many scarves or veils, and I felt a little silly covering outside of the house because you just didn’t see that sort of thing here where I live. Not to mention that my husband wasn’t too keen on the idea (then anyway). So, I stopped. For nearly 3 years. During that three years, I became an agnostic atheist, which is to say that I am unsure if any higher power exists, and while I doubt, I cannot prove or disprove it. I lean towards the belief of no Deity at the moment, though I still believe Nature itself is divine and I celebrate the passing of the seasons, and mark the days with celebrations, even if it’s just a small acknowledgement of it. Because of that, I have no religious reason to cover my hair. None whatsoever. But I rediscovered my love for it. One day, out of the blue, I started covering again. It wasn’t something I set out to start doing, but I revisited Andrea’s blog and YouTube channel, and discovered Rivka Malka’s blog and YouTube channel. I went into my room and dug out my scarves and Israeli tichels (as I mentioned above, I didn’t have many at the time) and immediately began covering. I suppose you could say I heard a call, not with my ears, but with my heart. I don’t believe it was a call from a Deity, personally, but more of my own desire to acknowledge something beautiful within myself. Right before, though, another group that I’m in had a couple of girls who decided to try and cover during domestic duties. They began to ask me about it. That reaffirmed my desire to start covering again. I cover every day, even at home, as it keeps me from sweeping up hair all the time and pulling my hair as well. Plus, it makes me feel gorgeous, and since it sits on my head, it keeps me mindful of things. It reminds me to use my head when I would rather use my heart when reacting to things. I am a very emotional person, and I have issues with anxiety and my tichels and headcovering practice helps me deal with it by giving me something to focus on rather than what is causing my anxiety. It also reminds me that I am a QUEEN – and I mean capital Q-U-E-E-N! I use that term to remind myself that I am in control of myself, my body, my mind, my spirit, my entire being. My tichel is my crown, and now my husband is on board with me covering (as he put it, it’s my head and he would love me no matter what). I love discovering new combinations, new ways to tie. I even made a tie myself, that was inspired by The Girl with the Pearl Earring painting. I have begun to do tutorials for women who are just starting out, because I can show my hair. I can show from beginning to end how I do it, and give them tips that they may not be able to see anywhere else, because I am able to show my hair as a secular woman with no commandment from a Deity to keep my hair to myself. Of course, I’m not knocking those who DO. It’s just not my particular calling, and if I can help a woman who feels it IS her duty to keep her hair for her husband but doesn’t know where to begin, I will do so. And I will love every minute of it! Yay, Heather! What a beautiful discussion–and what phenomenal pictures. I loved hearing your whole story, which while different from mine has certain similarities. And I’m so glad you included the picture of your son! Thank you SO much for sharing your story! I have done a lot of searching for information from secular and/or non-Abrahamic religious women who cover their hair. I don’t cover full time, but I love that hair wrapping is something that spans cultures, religions, times, and places. It was so interesting to read a different type of story here. Although I am religious, I don’t cover for wholly religious reasons, so I empathized with many of your remarks. Best wishes for the fascinating journey you are on. I’ve seen your lovely tichel photos on Facebook but didn’t know the story of your covering journey. I enjoyed learning how you started, stopped and then continued covering with confidence! It’s exciting to “meet” other women who cover their hair even though it’s not a part of their culture stream. I’m a Quaker who felt called to wraps and covers and bonnets, even though many Friends laid that practice down a hundred years ago. Thanks for sharing Heather’s story, Andrea. I love your story, Heather! I’m always glad to see women of so many diverse backgrounds on Wrapunzel and hear about their journeys. I happen to be Christian though the reason I started covering was not religious, it was due to medical hair loss. Still I choose to cover visibly most of the time even though I own and could just as easily wear wigs. The practice has evolved for me too and does include some spiritual dimensions as well as practical, cultural, social/political, and artistic ones. Heather- I loved reading your story and the way that you are sticking to what feels true to who you are. Even more than that, I admire the mindset that brings you to make tutorials “from scratch”, making use of your unique beliefs and life to help people who may not be similar to you (as well as those who are). It’s a really service-minded approach that I really admire. Yes yes – I totally feel the same way! Heather is really incredible! So awesome. I love reading people’s reasons for covering their hair. What an amazing journey Heather. I guess we all have our stories as to why we cover. Each and every one is inspiring and unique. You are an amazing woman and your wraps are wonderful. Thank you so much for sharing. Thank you so much for sharing your beautiful story and beautiful coverings. You are an inspiration! Wow! thanks for your inspiring story. 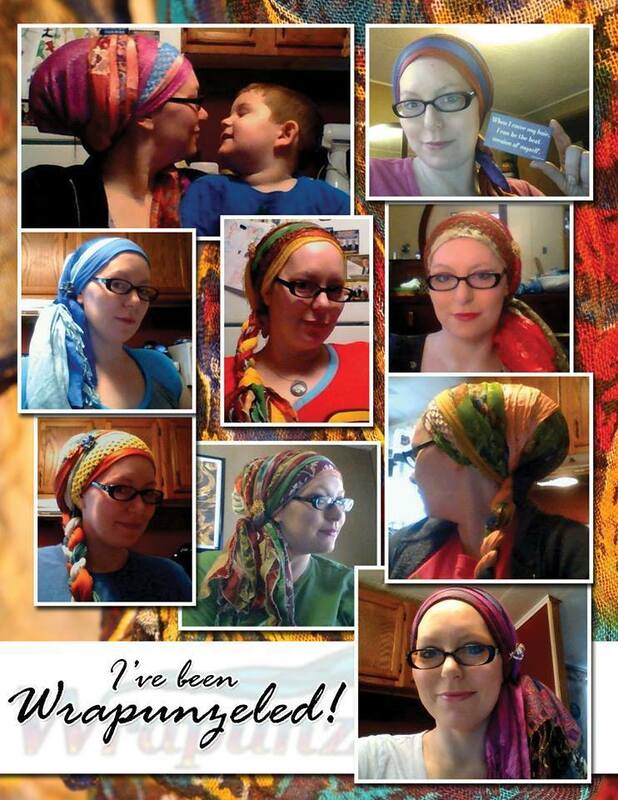 Your wraps and colors are very beautiful. Heather, I’ve known you personally for years, and I have to say that you keep getting more beautiful and inspiring as time goes by! Thank you for sharing this. Hugs from France to you Heather, Mirjam. Thank you for your story, Heather! 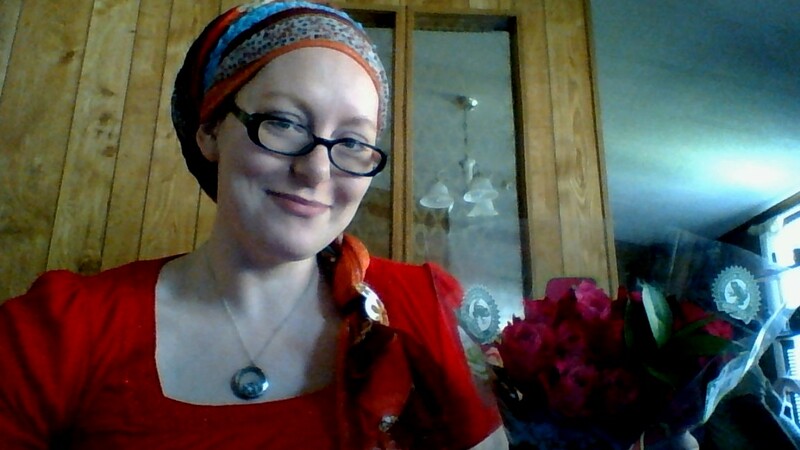 Something resonated with me – as I am not Jewish myself but experimented with headcovering, I feel connected to that inner call that is not religiously motivated. For a few weeks now, I have been covering nearly full time for the first time in my life, and I feel an inner focus, spiritual protection, and connection to myself that I never experienced like that before. Thanks for sharing! @Jodi Lindley- Thank you for those beautiful words! What a great picture, “a mixed jar of spices”! Shalom to you! I was waiting for a face to face with you to ask about your wrappings..who am I kidding, I probably would have chickened out! They are lovely and so are you! I’m glad I know the story now! Heather, thanks for sharing your story! do you blog somewhere or how can we get to see your tutorials??? It’s wonderful to have read your headcovering story….from start to the present. I used to cover when I joined up with a Mennonite group….but was never comfortable with the whole thing and felst strange….both physically and emotionally. But coming upon Rivka Malka and Andrea my world and thoughts have changed with the beauty they offer. I had a male friend tell me it brings out the ‘essence’ of who I am. That was very ‘stunning’ to know….and does go along with your views of yourself when covered….and others who cover too….the only person I have trouble over it is with my 48 year old daughter….but I can’t listen to her or I will uncover. And that is NOT going to happen anymore….besides, I now have so many tichels they would go to waste! So it’s tichel wraps for me everyday, everywhere….maybe even when gardening…just a simple single square for that venture. Hannah….so pleased to be able to read of your challenges with this issue and how you made it through to the place you now are……you do encourage me with your story. Thank you so much. Thank you for sharing, Heather, and hats off (figuratively, of couse) to Andrea for creating this blog with its totally unique readership. I really, really appreciate learning about such a wide variety of journeys. I love the idea that someone would cover for non-religious reasons and I’m so glad you shared your experience. I second SDK; this is such a special blog attracting such a varied readership. I’m so thankful to have found it. I appreciate everyone telling their stories. Like Heather I, too, am secular. I don’t know anyone else who is secular who covers, so I’m so grateful to hear her story. Thank you for sharing it. I’m Pagan too, and I cover as devotion to Hecate. I’ve found that there are quite a few deities that women cover for, Poseidon being the most intriguing for me. Thanks for sharing your story….I also have what you call an obsession with my hair. For me, it’s never good enough. People say I’ve beautiful hair, but I, on the contrary, am quite insecure over it. But now I realize that this ‘excuse’ is good enough. It’s my body. And as you say, it makes me feel elegant an regal. I’ve been covering my hair for many years, and no one has ever asked me “why?”. Just hold your head up and smile, that’s all you need to do. Be prepared to get lots of compliments on your scarves, though!